Defending a national championship and being ranked number one means facing extraordinarily determined opponents who want nothing more than to knock you down. That pressure finally caught up to No. 1 Cal men’s water polo in the MPSF Pacific Invitational over the weekend as UCLA sullied the Bears’ unblemished 10-0 record in an overtime spectacle. Aside from the loss to UCLA, the Bears topped Air Force, Pepperdine, and Stanford. It wouldn’t be accurate to say that Cal simply fell apart in its loss. The Bears dismantled an overmatched Air Force squad on Friday 24-7 as most anticipated. Eleven different Cal players contributed at least one goal while the senior goalkeeper Kevin Le Vine made twelve saves. The Bears’ success continued on Saturday morning, as they faced off against the No. 9 Pepperdine Waves for the second time in eight days. The two teams’ last meeting featured one of Cal’s closest matches of the season with only a two goal margin of victory. 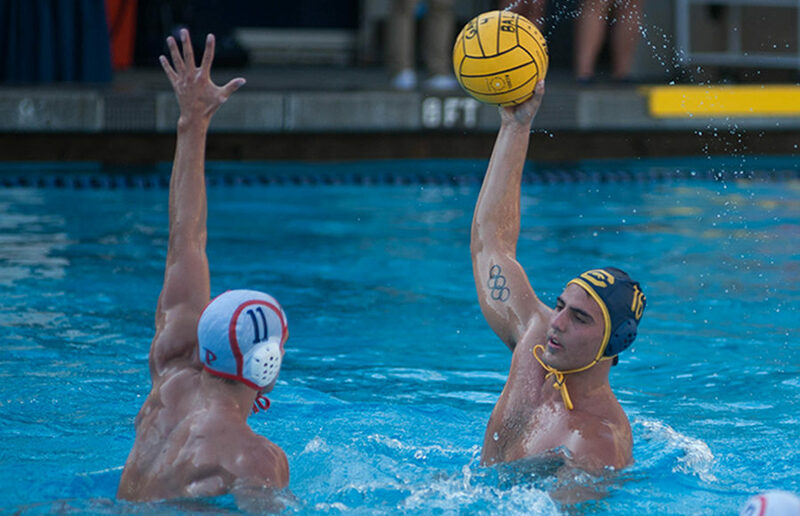 A similarly close game saw Cal trailing at the end of the first quarter, but with the help of junior Odysseas Masmanidis’ four goals, the Bears came away with a 12-10 win. The day didn’t get any easier when Cal faced fourth-ranked UCLA, a team seeking revenge against the Bears, Saturday afternoon. Last season, Cal ended UCLA’s postseason campaign in the NCAA semifinals, edging them with a single goal on the way to the Bears’ title. The two heayvweights exchanged blow for blow with the difference between the score never exceeding two goals. As the end of regulation arrived, the two teams remained deadlocked at six. Despite goalkeeper Le Vine’s impressive seventeen saves, the Bruins knocked off the reigning champs 9-8 in overtime, dramatically handing Cal their first loss of the season and ending their fifteen game winning streak. “We let one slip away with UCLA, got a lead into the overtime and then you know made some critical mental mistakes in the overtimes that just gave up goals that were a little bit too easy because we were making a bad switch or lack of communication.” said Cal coach Kirk Everist. After the loss, the Bears were matched up against rivals No. 3 Stanford Cardinal for a third-place consolation match. Cal needed to find a way to put forth a strong effort in the face of fatigue from playing their fourth game in just over 48 hours. In the opening, Cal still looked sharp, however, as they went up 3-0. Stanford would claw their way back into it though, taking a 5-4 lead by halftime. But Cal’s consistent teamwork (assists on 8 of their 11 goals) caught up to and overcame the Cardinal in a back-and-forth affair. The final score was 11-9, marking Cal’s fifth straight win over their Bay rivals. The victory showed a level of resilience that bodes well for the future of the season; the Bears bounced back unwaveringly after suffering such a heartbreaking first loss. However, the tournament exposed Cal’s vulnerability for practically the first time this season. There is no question that Cal is an elite team and likely contender to repeat, but it must find a way to convert regularly on powerplay advantages. Paradoxically, having a undefeated record can sometimes hurt a team in the postseason for lack of experience dealing with adversity. Perhaps shedding the “undefeated” label will allow the Bears to better assess their weaknesses and fare more favorably in the postseason.